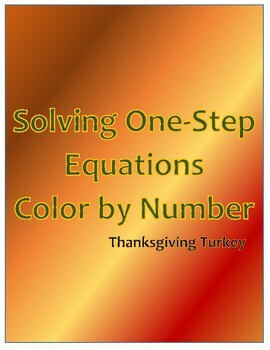 Keep your students engaged near Thanksgiving (or anytime of the year) with a color by number. In this activity, students will practice solving 25 one-step equations and divisibility rules. 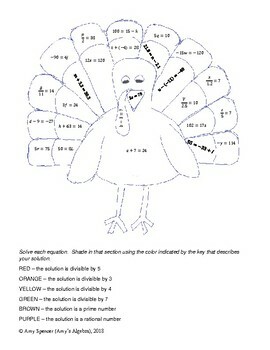 The color to shade in the turkey picture will be determined by what number the solution is divisible by. In this set, 21 of the one step-equations require adding, subtracting, multiplying or dividing by positive and negative integers; there are 4 problems that involve decimals.